Hiya phew we really are celebrating hard this month in our team. Today is Kate’s Happy Day!! 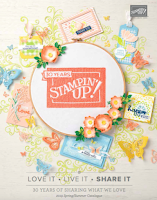 Kate is a fairly new demonstrator who started really strong, and loves her Stampin'Up! journey, I hope it will take her to the heights she has set. Kate loves the colour green and there’s only one green for me right now, Wild Wasabi. I simply love this colour, is fresh and cool and it suits my mood. I have paired it with Baja Breeze ( I am using this colour far to much as well lately) and Basic Gray. I am also using up more papers lately, here I have used the gala greenhouse one. The friendship wheel was wheeled across a piece of basic grey card in black ink. I die cut a scallop circle and using the crop o dile I have punched out a circle inside each scallop, I know a bit fiddly but Kate is so worth it . Next a white circle was embossed using the Vintage Wallpaper embossing folder and it got adhered to the grey one. Stamped the birdcage from Nature’s Walk and cut out. I popped it on some dimensionals and used a row of tiny pearls to add as rope from the 3D roses and leaves. I had a go at circle roses and they were not that easy, the concept is very easy but I think I need to practise a bit more. Kate hope you had a fabulous day, HAPPY BIRTHDAY my lovely. Today I took a decision that I would give up my day job and take Stampin’Up! on a full time basis. My notice went in and depending how quick we can find and train someone to take over my position I should start working from home full time in about a month’s time. I am so excited now the deed has been done although I am a bit scared and I know I will miss all my lovely colleagues. I know SU will keep me plenty busy and I am looking forward to it already, you should be happier here with more posts at least . Right got to go and answer some emails, I will see you again soon with yet another Birthday Passionette card. EDITED TO ADD. I had so many emails about those roses I decided to shoot a video, enjoy !!! Love this card, Monica but especially the scallop circle punching the holes in it - cute idea!! Another stunner Monica - thanks for visiting by blog too! Gorgeous card as always! Congrats on making such a big decision - I know you're not going to regret though - you'll just go from strength to strength! Beautiful card Monica, gorgeous colours! And of course many congratulations on being able to make your decision on leaving work to craft full time! I'm looking forward to seeing a lot more cards, will we have daily posts? Wow! Your cards are absolutely gorgeous as always Monica, love the idea of the holes in the scallop circle! Good Luck with your decision to do Stampin Up full time! I never knew how you managed to do both! Will miss you at the meet on sunday, have a good day and see you soon. Firstly, congratulations on the BIG decision that you've just made. You'll be a fabulous full-timer with SU! And, as for this card, it has roses on it, so of course I just love it! Ooooh Monica, I just love this and as a brand new demo I am just planning an order which includes lots of ( if not all ) the goodies you have used so thanks for the ideas!!!! Starter kit coming today , can't wait !!!! What a gorgeous card Monica!!! I also sending you a big congrats from OZ on your decision to SU full time...you will ROCK!!!! Wishing you well in growing your already fabulous business. another lovely card - how did you cut the white circle??? I am sure you will have made the right decision - you are a great motivator and have encouraged so many people with your lovely and informative blog. My very best wishes for the future. Yum, yum, yum! This is De-vine!! All the best with your decision to go full time. Looking forward to seeing all your lovely new creations. this is a truly magnificent piece of art. Thank you for sharing. So pretty! Love the birdcage, the colors... the flowers are lovely! Beautiful card. Thanks for sharing the video on how you did the roses. I was wondering about them also. I am going to give them a try.